WOW! Concussions are no joke! A week and a half ago, I wasn’t paying attention when I was walking in an unfamiliar place, and totally walked into a doorway and smacked the top of my head. Hard. What I thought was just a bad hit and a big bump, ended up being a concussion. Having had experience with my son having a concussion, I felt like mine wasn’t too bad and followed the doctor’s orders which consisted of; lots of rest, no screens, no reading … to quote her “live a boring life”. From dizziness, to nausea, to just wanting to sleep all day and stare out the window, to complete boredom and finally to Marie Kondo-ing ever single dresser drawer I could get my hands on, I’m happy to now share that I feel better in spurts and feel like I’m on the other side of this head injury. Seriously though, if you bump your head, even a little bit, make sure to get it checked out. I’ve heard some horror stories over these last few days. Technology in moderation now that I’m feeling better. I just couldn’t wait any longer to share this easy and beautiful printable that I created! 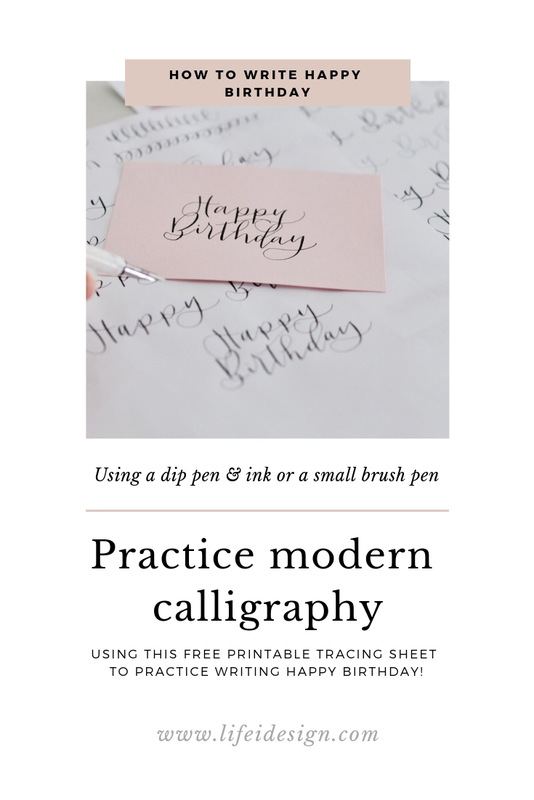 Learn and practice how to write “Happy Birthday” with this free practice sheet and impress your friends and family with your beautiful calligraphy! I created this really easy and fun tracing sheet last month and share it in the Creative Library for my subscribers to use and enjoy practicing lettering Happy Birthday! 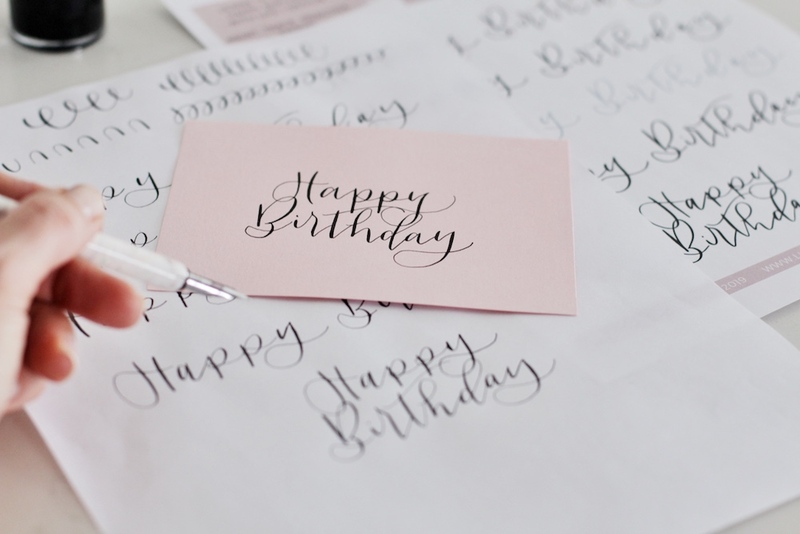 At one of my last workshops, it was requested by some of the attendees that I demonstrate how to write “Happy Birthday” in my modern calligraphy style, so that they had it to practice tracing at home while they continued their learning. Use a dip pen and ink, or a small brush pen to practice and trace using this printable tracing sheet. It made me think, what a great idea to share it with anyone who is looking for more practice, and to be able to trace to grow their calligraphy writing confidence and skill! Practice writing “Happy Birthday” easily with this tracing sheet by life i design. Next, download the practice sheet here. The only thing left to do is to impress your friends and family with how beautifully you write in modern calligraphy style lettering!! I hope you enjoy this printable that I created. I’m happiest when using my pen and ink, creating fun and flowy calligraphy lettering, but am as equally excited to be able to share my passion! Now, time to turn off technology and back to staring at the walls for a bit. Sign up with your email address to receive news and updates and get access to the Creative Library.